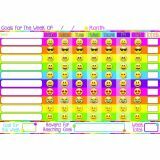 Smart Poly™ Emoji Goals measures 13" x 19", Decorative and fun. Write-on, wipe-off heavy duty, washable all POLY chart. NO LAMINATION NEEDED, NOT A PAPER CHART. Use with dry erase and damp wipe markers. Use pins, tacks, staples, etc to hang in classroom or home. Great for reusable learning. Guided Reading: Analyze for first and second grades makes lesson planning easier with six sets each of six nonfiction readers. There are 36 readers—two each for below-, on-, and above-level student readers. This teacher resource book helps engage students as they learn about Japan, zoos, pets, and more. 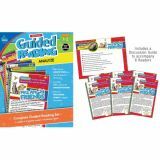 Ready to Go Guided Reading: Analyze offers the essentials for an effective, comprehensive guided reading program for first and second grades. This book includes leveled readers that cover high-interest topics, prompts to encourage students to work with the text and text features, discussion guides, graphic organizers and an observation sheet. Each nonfiction reader contains short nonfiction texts, vocabulary banks, photographs, charts, and maps. 80 pages plus cover . Grades 1-2. Ages 6–8. 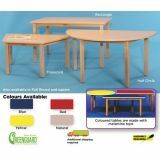 Fade-resistant colours; 50 lb. basis weight paper. Facilitate school to home communication with this durable two-pocket folder that makes carrying papers to and from school a snap. Sturdy enough to last through the school year. Helps teach responsibility and organizational skills. 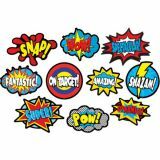 Printed on card stock, durable classroom cut-outs are ideal for a variety of purposes. Largest piece measures 5.5" x 5.3". Smallest piece measures 3.5" x 3.3". 39 pieces (12 large stars, 12 medium stars, 15 small stars). Ages 4–11. 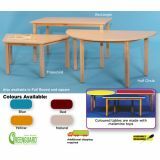 Available in woodgrain top with maple edge binding, or coloured melamine tops with white edge binding. Legs are 1.5" hardwood. Not sticky to the touch, yet they stick to any smooth surface and can be easily removed. You can even use water to rinse lint or dirt off the back surface. Clingy Thingies® can be used again and again without leaving any mess or residue. They also feature a write-on/wipe-off surface, perfect for notes, labeling, and reminders. Largest piece approx. Largest piece approx. 3½" x 4⅝". 18 pieces per pack. This die-cut Leaves Border brings a nature-inspired look to bulletin boards. 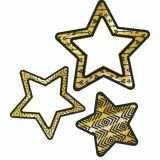 The natural leaf pattern makes it perfect for use in classrooms or learning settings using the Reggio-Amelia approach. 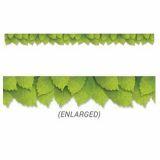 The serene look of this border makes it versatile for use on any bulletin board or display in a school, an office, a college dorm, a senior living residence, a church, or a daycare center. 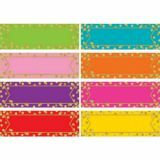 Use this vibrant green leaf design border with our Safari Friends and Woodland Friends décor collections, or with any classroom theme that relates to animals, outdoors, nature, and camping. 35' per package. Width: 2.25". 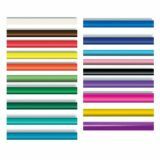 Grade K.
Durable, reusable magnetic décor measures about 4¾" x 1½". 8 colors. 20 pieces per pack.